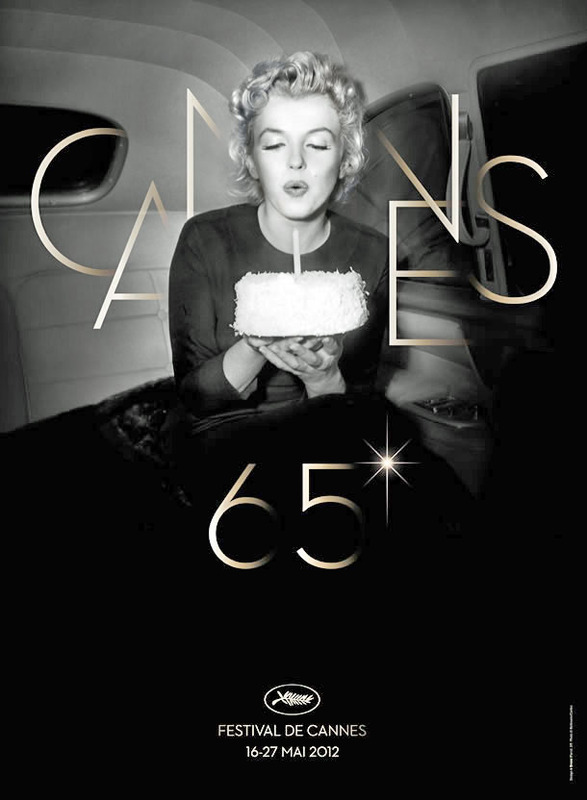 The rain started again on the normally sun kissed Mediterranean coast of France so the 65th Cannes Film Festival came to a soggy finish with umbrella holders getting as much camera time as the movie stars. Cecilia Cheung looked perfect and perfectly at ease even though she was dragging the soaked hem of her gown. Gong Li also braved the elements wearing an outfit that, unless she is representing a sponsor such as Dior or Louis Vuitton, has become almost emblematic: Empire waist with a tightly cinched belt, very low cut front (here a deep V) with few accessories to distract from what people actually turn out to see. 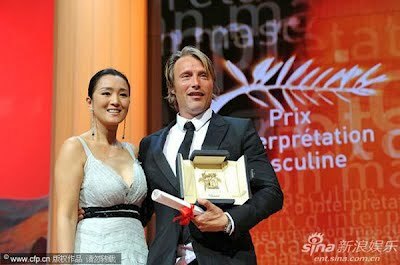 Once she got inside, Gong Li presented the best actor award to Danish heart-throb Mads Mikkelsen for his role in The Hunt. Faye Wong and husband Li Yapeng spent a busy couple of days in Beijing dedicating a new children's hospital and raising money for their Smile Angel Foundation. The Sweet Angel Children's Hospital (嫣然天使儿童医院) is the first private not-for-profit hospital on the Mainland. It has a craniofacial center, 50 functional beds and four operating rooms and should be able to treat 600 children suffering from cleft lip. First there was a dedication and ribbon cutting for the hospital itself. Li Yapeng in front of the Smile Angel Foundation logo for which some graphic artist should have a special place in designer heaven--it is a wonderful image. Evening means a tuxedo suit replaces the orange polo shirt, blazer and slacks for Faye Wong. It looks as if she and Carina Lau decided to use the same color (black of course) and the same palette for their make-up which is striking on each of them. There were plenty of friends and celebrities at the fundraising dinner that included ten separate boutique auctions, including Huang Yi and Na Ying. A quick trip down memory lane: Faye Wong and Li Yapeng at the first Smile Angel Foundation fundraiser in 2006. Cecilia Cheung was busy promoting Dangerous Liaisons at parties and other appearances in Cannes over the past couple of days. She chatted the paparazzi covering the premiere of Korean entry The Taste of Money, posed with Dangerous Liaisons director Heo Jin-ho and gave some fans a thrill by having her picture taken with them. Nice white dress with spaghetti straps and a lot of embroidered detail. Later she lit up the party given by the luxury jeweler di Grisogono wearing a simply cut strapless gown cut perfectly on the bias from a lovely pattern of white and pink, accessorized, one assumes with a necklace and ring provided by her host. Xinhua pointed out that she was the only Asian actress invited to the party which could be a reflection on the party, any other Asian actresses in town or Cecilia herself. Whatever the case, she did her job and looked great. The filthy weather had finally cleared so there was the de rigueur waterfront photoshoot. Not to be missed was the interview with Sina while holding their logo. After the Killing Them Softly premiere Li Bingbing dropped in on new BFF Milla Jovovich who was relaxing poolside. Lots of reporters and photographers were there to record the reunion of Alice and Ada Wong from Resident Evil: Retribution. A day or two later Gong Li arrived in town and the sun shone on Cannes for the first time in days--it has been a dreary, rainy festival with postponed premieres and scrambled schedules due to very heavy rain that knocked out on of the main venues. Gong Li may not have brought the sun with her but she made the most of the lovely days on the waterfront. She will be on the red carpet for the closing ceremonies later tonight. It was Cecilia Cheung's 32nd birthday and she celebrated with a big cake while in Cannes hyping her film Dangerous Liaisons which premiered there. She looked just fine as herself, especially in the outlandish tapestry boots but Chinese news portal Xinhua made themselves look ridiculous by claiming that she looked like the Cannes 2012 logo of Marilyn Monroe blowing out a candle on a cake and then not running a picture that showed what they reported. Meanwhile back at the festival, Dangerous Liaisons unspooled to a packed house. Cecilia spoke briefly to the audience in French and settled down to watch the movie, very possibly seeing it for the first time after editing and with the music and sound added. And what, you may ask, has Li Bingbing been doing during the early days of the 65th Cannes Film Festival? It turns out that she has been as ubiquitous as yachts in the Cannes harbor, looking absolutely smashing at every appearance. This look was close to a showstopper even in the temporary epicenter of world-wide hype and glamor. The red carpet for Andrew Dominik/Brad Pitt anti-gangster gangster flick Killing Them Softly was the setting. This outfit did double duty, first for the premiere of Madagascar 3: Europe's Most Wanted and then for the party celebrating the restored version of Sergio Leone's Once Upon a Time in America given by Gucci, for whom LBB is a brand ambassador. Not even Brett Ratner could darken the mood. For the premiere of Once Upon a Time in America there was this elegant pale yellow gown. This deep-V neckline in both front and back served for the red carpet for Alan Resnais's Vous n'Avez Encore Rien Vu (You Ain't Seen Nothin' Yet)--Resnais insisted on the slangy English subtitle. For those keeping score at home it has been 53 years since Hiroshima Mon Amour opened. Qi Xi and Hao Lei in Cannes for "Mystery"
Vicky Zhao Wei and Zhou Xun in "Painted Skin II"
A bit more on "The Raid: Redemption"